You can redeem those SB for free gift cards. 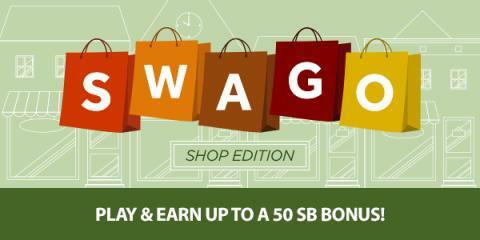 If you've never used Swagbuck before, participating in SWAGO is a great introduction to the site and an easy way to earn a good amount of points quickly. • Shop Swago will begin on Monday, October 23rd at 9am PT/12pm ET, make sure you hit Join otherwise you won't get credit for completing the action items. Each square on your Swago Board will contain an action item to complete. • Once you've achieved a pattern the corresponding Submit button will light up. You can have multiple patterns available for submission, however, you can only submit ONE pattern so choose wisely. • The game ends Friday, October 27th at 12pm PDT/3pm EDT. So make sure to hit Submit on the pattern you wish to submit. If you don’t hit Submit before the game ends you won't receive your SB bonus.